Still trying to solve the mystery of what happened to Dean, Sam enlists the help of Sheriff Jody Mills; Castiel continues to be a father figure to Jack. - At least we got to check in a bit with the Wayward Sisters crew (via Jody) even if I'm still not over my disappointment that the CW didn't pick up the Wayward Sisters spin off. I also feel like this was a missed opportunity for a Donna cameo. - So did the show just confirm that Claire had a romantic interest in Kaia? Jody said "first love" after all. I totally got that vibe at the time, but I figured it was just going to be left subtextual. It's cool that they're making it explicit, although I wish we could get to see Claire's reaction to all of this. Since Claire seems destined to just be an occasional recurring character, I guess they don't have much to lose by just putting it all out there. - I had wondered if they were ever going to go back to the Kaia double. At least we got some follow up in this episode. So do we think dark!Kaia is going to eventually join up with Team Free Will? It seems like they are hinting at that possibility. - So Michael hopped out of Dean because of Kaia's spear. Presumably he found a new vessel? Also he's still doing his little monster experiments, apparently. - I'm not a fan of all these random Apocalypse World extras hanging around the bunker. I really wish they would come up with an excuse for them to go live somewhere else. Not that the show couldn't use some more recurring characters, but since no time has been spent building up these new characters, I'd rather just have them hang out somewhere off screen. - It seems like just letting Lucifer's vessel aka Nick just wander around isn't such a great idea, but I guess they have bigger fish to fry at the moment. - So does Jack have consumption or what? My take on it is that Jack isn't a regular angel. He's not inhabiting a body. His body is made up of human bits and angel bits. Without the angel bits he's falling apart. I really wish they would come up with an excuse for them to go live somewhere else. They're redshirts, they exist to die for our amusement, painfully and graphically. The writers have killed off everyone they can, multiple times, they need fresh, disposable blood. If any besides Bobby and Charlie survive the season I'll be surprised. I do appreciate that Jules survived the episode. I worry for any named characters they introduce from Apocalypse World that isn't Bobby. I half expected the spell to require a sacrifice and Jules was going to jump at that (but the lamb eyeball in the "gross stuff" drawer was a great bit). The unnamed ones will be the redshirts and we're not meant to worry about them so... I don't. I'm glad we got to catch up with the Sisters too. I just wish we could actually see them. At least we now know more about The Wild One. And just FYI Briana Buckmaster and Kim Rhodes are launching their own The Wayward Podcast. I'm not sure what the focus is, but it seems to be about their lives and general stuff, not necessarily Supernatural. I was kind of amazed that Laura didn't stick around to be Jack's new love interest. Everything seemed to be headed that way and I'm sure the writers must have at least considered it. Maybe it would have felt too contrived but part of me wishes it had happened. It could be interesting to see Jack in a relationship at some point, and while we didn't get to know Laura that well she seemed like she had an interesting past. As for Jack's sickness, I wonder if it's some form of attack by Michael, or maybe Lucifer (wherever he is) is trying to possess him or something. I'm thinking that the recent scene were Jack was willing to sacrifice Dean wasn't just there to give Jack a dramatic moment. I'm guessing that at some point this season Dean will be possessed again and Jack's willingness to off him will come up again, or at least that there will come a moment where Jack's ruthlessness regarding Michael will bring him into conflict with the bros. The mention that they'd called Rowena for advice made me think that actress must not have been available this week. This would have been a natural opportunity for her to show up and we haven't checked in with her for a while. I think that they were unambiguously saying that Claire had been in love with Kaia, which just makes me miss Wayward Sisters more. They had the pieces in place for a really cool show. Nthing that I wish Wayward Sisters had become a show instead of frigging Charmed (wasn't into it the first time or the second). I'm glad they're continuing the plot of it. It did seem odd for all that Claire was brought up, that she wasn't in the episode. I was kind of amazed that Laura didn't stick around to be Jack's new love interest. I was surprised to read this because I had assumed she would be his love interest. (And I was kind of annoyed by it because love at first sight is such an annoying trope and because she didn't seem interesting to me.) I didn't remember it being shown that she left. My daughter thought she went back to her parents but couldn't remember for sure if that was shown or stated. Even if she did go back to her parents, they could have her come back later. It looks like Michael really did leave Dean, which seems dumb. What't the point of setting up the whole "OMG Michael has taken over Dean what will we do?" thing if it's just going to resolve itself after a couple of episodes? But of course that's the kind of thing this show does all the time. I would have been annoyed but not too surprised if Season 14 had started 6 months after the end of Season 13 with Dean showing up at the bunker saying Michael was gone. Last night we re-watched the episode where Nick said yes to Lucifer, trying to see if Nick could have been the one to kill his family. Lucifer talked to him about "that man" coming in and killing them, which doesn't really make sense if it had been Nick himself. But maybe Nick blocked out the memory of doing it and convinced himself it was someone else, or maybe Lucifer deliberately changed his memory of it when he talked as if it had been someone else. Even if that wasn't the original intention of the writers, I think they could plausibly make it true retroactively. But I'm now leaning towards thinking that either Nick was damaged by being Lucifer's vessel for so long or some bit of Lucifer's grace is still there. My husband reminded us that after Sam was possessed by Gadreel some grace was left behind. So I guess it's reasonable to think that happened with both Nick and Dean. My daughter is an ardent Destiel shipper and she was disappointed by the lack of any Destiel fodder when Dean and Cas were reunited. They didn't even hug! But she was happy that Claire/Kaia was officially declared to be a thing. If Wayward Sisters had happened, I imagine one of the plot threads would have been Claire gradually falling in love with new Kaia (after initially hating her because she killed old Kaia.) I wouldn't be surprised if they still made that happen, but we probably won't see much of it because they won't want to devote too much screen time to it on a show that's really about Sam and Dean. The Kaia story line is the most interesting one they have going. I assume she and her meat fork will end up playing an important role in defeating Michael. Maybe her world is the one that will somehow be turned into a paradise through Jack's intervention. Cas's vision of Jack bringing about a paradise has to come true eventually or I'm going to be dissatisfied. Clearly they're not going to make our earth turn into paradise. I was guessing Jack would bring peace to Apocalypse World and maybe that will still happen. But it could also be Kaia's world that gets fixed. Or heaven. Jack could bring about improvements to heaven, turning it into something that's less like a prison and more like an actual paradise. I think that would be the direction I'd go if I were writing the show. Yeah, they did say Laura had gone home to her mom. I remember because I was like, "Wait, what? So, she's not gonna be a love interest, then?" Also because she'd said her mom would hate her for running away, and we never got a scene where somebody convinced her that her mom would probably just be really relieved to see her again. I'd forgotten the thing about Jack bringing about a paradise. Yeah, I think that'd have to be the parallel Earth. Either that or it's a series finale thing where Jack somehow eliminates all the monsters on our Earth, or maybe an ironic thing where at some point he turns the world into a "paradise" because there are no people or everybody's artificially happy or something, and the Winchesters have to fix it. I am not a "Destiel" shipper but the reunion of Cas and Dean did seem a bit underwhelming. I'm guessing they gave the hug bit to Jack to show that he did actually care about Dean despite him being all "let's off Dean" in that other episode. Unfortunately that did leave Castiel seeming kind of casual about the whole thing. At this point these characters have all been freed from possession, resurrected from the dead, brought back from hell, et al, and the writers must be running out of ways to do emotional reunion scenes! I think it was coming across as Jack caring about Lora (not Laura) to give a real stake to her dying, so his motivation to find a cure would feel more earned. It worked for the most part to give Jack a win, and I think that was just it, without Lora recurring. But you never know with this show. But could that have been Nick's soul and not Lucifer's? The shadow cast from the death had wings, so I assume it's actually Lucifer. I think they're going with PTSD and ingrained violent tendencies. Like the finger snap at Castiel seemed to be muscle memory. I'm wondering when in the timeline Michael/Dean got stabbed by not-Kaia and how long it took after that for Michael to jump ship. He obviously didn't leave Dean as soon as he was stabbed, because the stabbing happened somewhere out in the forest. Did it happen shortly before Dean appeared sans Michael in Duluth? Did Michael take a quick break from laying his trap for Team Free Will to go and find Kaia? Or did it happen well before that? The scar on Dean seemed pretty healed over. Did the stabbing gradually make Dean's body less suitable as a vessel or gradually weaken Michael? Did Michael know what was happening? Did that figure into his trap plans at all? It could be an interesting twist if it turns out that Kaia's meat fork didn't drive Michael out after all. Maybe it was something else that made him leave, or maybe he hasn't actually left. 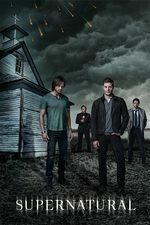 Maybe Team Free Will (and possibly the British Men of Letters as well) will put a lot of effort into trying to recruit Kaia or steal her archangel-vanquishing weapon only to discover eventually that it has no effect on archangels - but has some other important effect that will do something interesting to Dean. Yeah, the end of the Michael possessing Dean subplot did seem a bit premature. I mean, on the one hand, the show does struggle without Dean around, and it's not nearly as funny a show without Dean around. But still...there has been so much build up since S5 about what would happen if Dean said yes to Michael, and then it doesn't even last a full 2 episodes into S14? I also enjoyed seeing Jensen Ackles playing Michael, so I wish we had gotten more time with that. Also disappointed that there was no confrontation between Michael and Sam/Cas/etc. On a completely unrelated note, I can't express how much I'm against the idea of Jack having a love interest, and Lora/Laura really didn't interest me at all as a character. And really, he's only like a year old technically so that makes it even weirder. Jack is only a year old chronologically, but in terms of behavior and appearance he's at least a teenager. He's not a child in an adult body, he's already been fighting in interdimensional wars! He clearly has emotions so it hardly seems impossible he'd develop romantic feelings at some point. And I don't think there would be anything wrong with that, although he'd obviously have a lot to learn.